Lowering inspection cost by eliminating consumables (X-ray film, chemicals) HAZwaste disposal, processing equipment, time, film storage containers, and film storage space. Increased production shooting more welds per day, less setup time, less exposure time, (3 minute exposure time for a 24” x .562” weld), fewer x-ray crews working on mainlines. Immediate results, as soon as the exposure time is complete you can be interpreting results. Inspection results can be obtained online making it possible to correct welding settings immediately to avoid more defects/repairs. Great auditing tool, can upload to a dropbox or FTP each day, film can be audited by the owner the following day right in their own office. The ability to immediately assess any interpretation issue by emailing image to owner, 3rd party, or Level III. Premium Software tools for optimal image interpretation and a user friendly database. The system also records GPS coordinates. 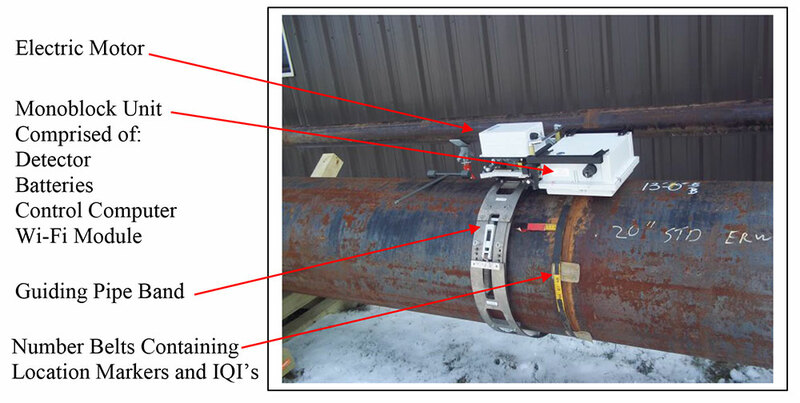 Portable light weight system intended for 16” to 72” diameter pipelines. The digital image is stored in a DICONDE compliant format to ASTM E2339-11 standard, which ensures the readability of all information, including metadata, using software by different vendors. Data storage: internal memory of the detector; in case of Wi-Fi connection failure, the exposure continues and the data is secured. Detector power supply: Li-Ion battery (battery life 2 hours, minimum charge time 15 minutes).